Prominent & Leading Manufacturer from Nagpur, we offer filter bags and pleated filter bag. We can custom design and fabricate a Filter Bags to meet your needs. We also offer equivalent replacement filter bags. 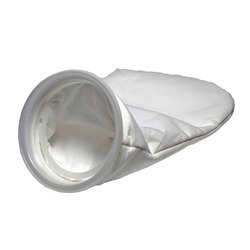 The offered Filter Bag is widely demanded in various industries for filtration purposes. The offered range is manufactured by utilizing optimum quality raw material and modern techniques. Filter Bags offered can be me available in different finish options as well as with superior material support. Our filters are carefully fabricated and sized to ensure ease of installation and change-out. Generally, dust collector filter bags are designed to be mounted and gasketed firmly into place with a snap band, corded cuff, or clamp to ensure dust type seal. Various coatings and finishes can be applied to either side of the dust collector bag to enhance cleaning and efficiencies, as well as prolonging service life. Ground wire, anti-collapse rings, and other options can easily be incorporated into bag construction. We can custom fabricate various types of attachments to work with your specific shaker mechanism, whether it's a loop, eyelet, grommet, or other device. In order to cater to requirements of clients, we are offering Pleated Filter Bag to our clients. It is known for its high utility in filtration applications. It has long filter life and is offered in bulk quantities. It saves cost and is offered to our clients in different range. Offered product range is free from defects and is widely used. We are offering this at competitive price.